Left-back Jamie Reckord has been released early from his contract by Ross County. The 24-year-old Englishman has not played for the Scottish Premiership side since being sent off in a 2-1 win over Hamilton Academical in February. Reckord, who signed for the Scottish Premiership club in October 2014, made 21 appearances this season but was due to be out of contract this summer. He played 48 times for County, all but two of them being starts. 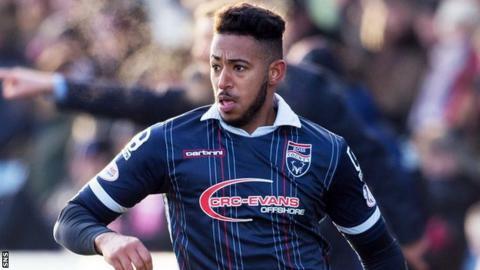 The Premiership club stated: "Ross County Football Club would like to thank Jamie Reckord and wish him well on what we know will be a successful next step in his career." Reckord, who was an England youth international, started his career with Wolverhampton Wanderers. He had loan spells with Northampton Town, Scunthorpe United, Coventry City, Plymouth Argyle and Swindon Town before being released in summer 2014 having only made two appearances for Wolves.